I’ve been searching for a good bread recipe. I can tell by just looking at the bread that this is good! Going to give it a whirl! Question: do u think I could use this to make burger buns also? 🙂 yes it makes great buns. My dad would drink buttermilk the same way. I’ve never tried it….don’t think I ever will. But I’ll have to try your bread recipe, it sounds delicious. I’ve never used a pinch of ginger in my bread recipes, looking forward to trying. Thanks for sharing. It helps the yeast to work better. Let me know what you think, Darlene! rise: however not as high as your loaves. I was also wondering why you baked it at 400? we still think the bread has a good taste it just does not look very nice. 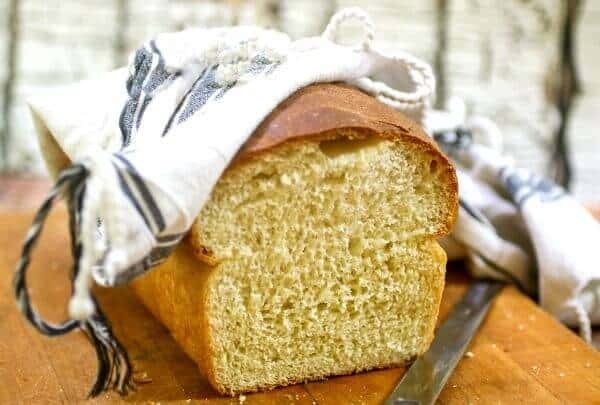 I am a rookie at bread making but I’ve made this bread several times now with wonderful results! Love this recipe! Got some baking now. I have fell in love with bread making. It is so relaxing and you get the reward of something wonderful to eat! That’s awesome! 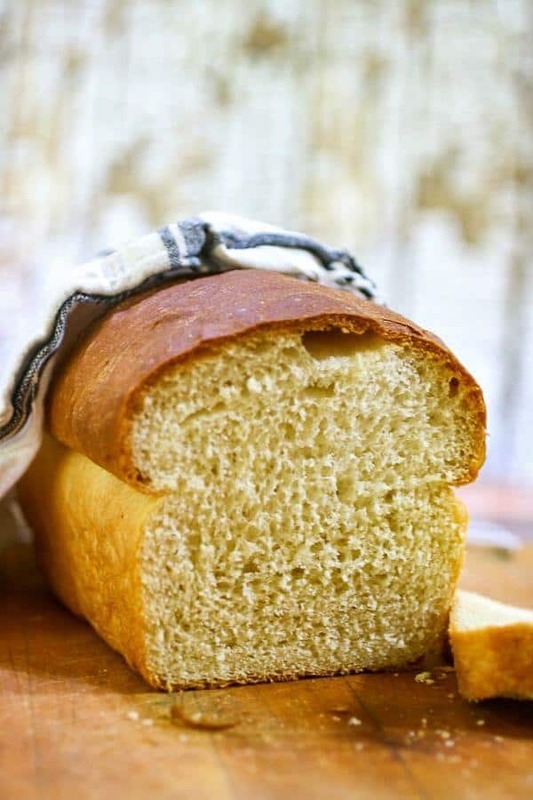 Have you tried any of the other bread recipes on the site? I plan to VERY soon! I have been baking bread for so many years that store bought bread now has a metallic, chemical aftertaste that is horrid. But I DO wish my bread had the “loft” that commercial bread has, but my slices tend to crumble unless held by both hands. Your recipe is delicious, truly, and the baking soda does help. I’m wondering about adding an egg? Made the Honey Buttermilk just like you instructed and turned out beautifully! My husband was so surprised. Love this recipe! Will make again. Thank you for sharing. Through sharing we learn and grow. 🙂 I am so glad you like it! I made this using 1/3 natural yoghurt and 2/3 skimmed milk instead of the buttermilk, and it worked beautifully. I baked one standard loaf, and rolled out the other half of the dough onto a sheet of silicon paper, spread it with more honey and chopped apricots and then rolled it up and coiled the roll to give a round sweet bread. A tasty, light loaf in both versions. I used to love when my mom made bread. I LOVE, LOVE, LOVE to cook and bake son naturally I started making bread. No one in my family, including my husband, cared one way or the other so I stopped making it. I just recently started making bread again, just because I LOVE dong it and to me it taste SOOOOOOOO much better. I can’t wait to try this and I will also make my own buttermilk. Thank you again for sharing………………. 🙂 please let me know what you think… and welcome back to the bread baking world! I don’t have bread flour, only all purpose flour, can you use that and still work? Yes. It might not rise quite as high but it will still be good! The buttermilk I purchased from the store I work at has an ingredients list of …. Does that mean it’s a better one to use or should I make it instead. No, that should be fine Valerie! Lucky you! I didn’t have time to search every comment so maybe this has already been answered…sorry. What is the powdered ginger and is it necessary. I actually work at the only grocery store in our town. I do know what ginger is and we do carry it but I don’t think we carry powdered ginger. Is it something that would be in the spice section or in the Asian section? If I can’t find it would it be ok to leave it out. Is there something I can substitute. What is its purpose.. thanks so much. Powdered ginger is in the spice section. It is ginger root that has been dried and powdered. It acts as a booster for the yeast but you could leave it out if you like. I’d also suggest buying my book. The link is in the post, Bread Bootcamp. It is an incremental approach and takes you through each step. There are no hard and fast rules with bread making. One day it will need 6 cups of flour and sometimes it will take 5. 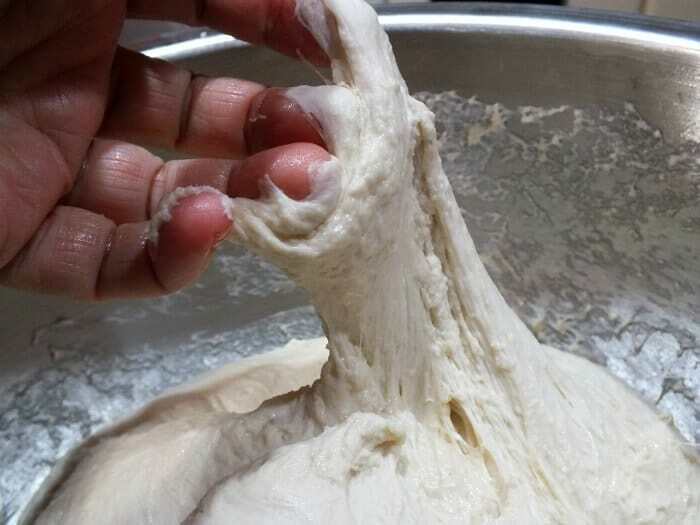 You have to go by the feel of the dough not exact measurements. Just half the recipe but use 1 envelope of yeast. Can’t wait to try this! Do search your stores for Kate’s Buttermilk, a really fine product churned from cream (It does have yogurt cultures) It enhances every recipe. Thanks so much for sharing this recipe, I ‘ve some lovely local honey that shoud be perfecrt. Well this is going to be my go to recipe from now on! The only thing, I do not own a bread baking dish! So I made these into rolls. 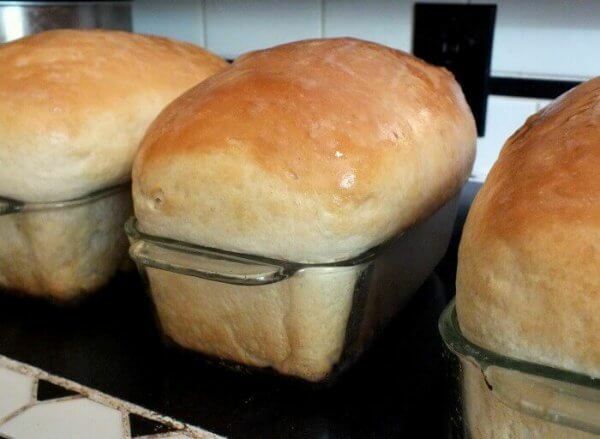 While they are fantastic, I’m going to get some glass bread dishes like you have and make this again! My grandsons were here after school. After they had their snacks, I pulled these rolls out of the oven. Of course they wanted one and all I heard was mmmmmmmmmmmmmmmmm. lol. Thanks for a wonderful wonderful recipe!! Thanks for letting me know! 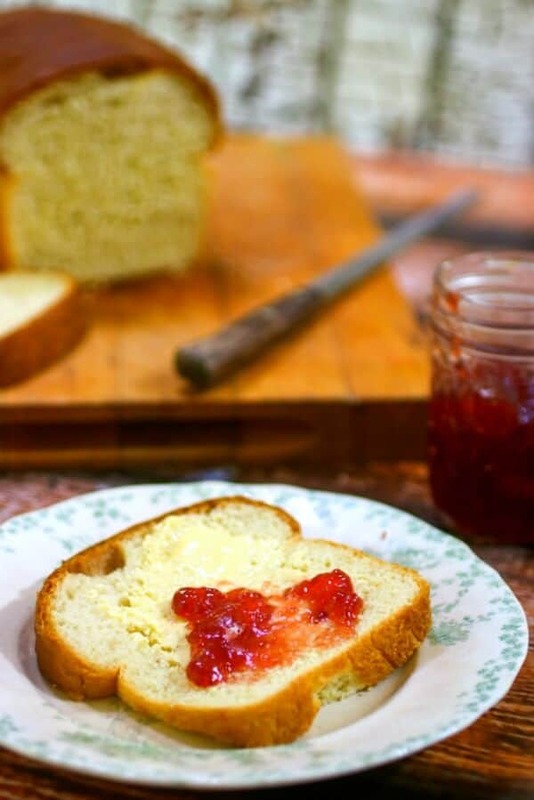 You might also like the buttermilk whole wheat bread recipe on my site! My neighbor makes some killer buttermilk bread! She made me and husband two whole loafs when we were down with the flu. I have been obsessed with her recipe ever since and am trying to find it! I will have to try this one for sure! Today was the first time I tried this recipe. The dough was quite stiff with the full 6 cups of flour. It also failed to rise completely and was quite heavy. 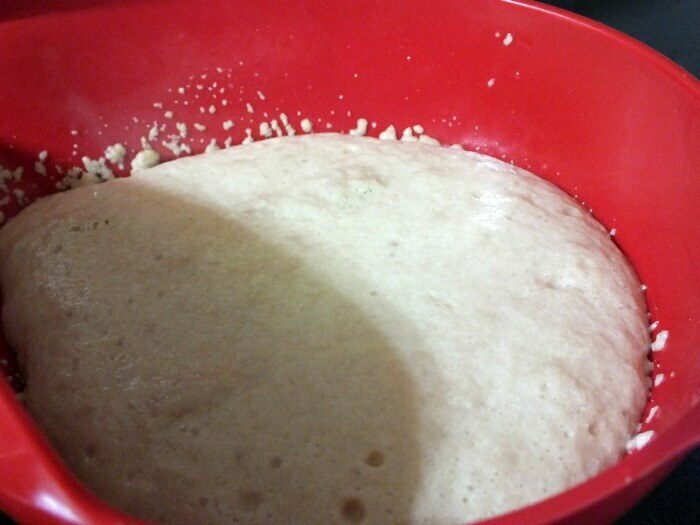 My yeast was fresh. Suggestions? Bread is not an exact science. You may need more or less flour even from one day to the next. It just sounds like you put in too much flour. Mine done the same thing! I’m thinking too much flour! What do you think 🙂 ? I made this bread this am, and it is easily the best bread I have ever made. It is fluffy, it is very tasty and it came out great. I think I had it in the oven a little too long as the tops of my bread was a little on the darker side, but nonetheless, the inside is so soft and moist and just perfect. 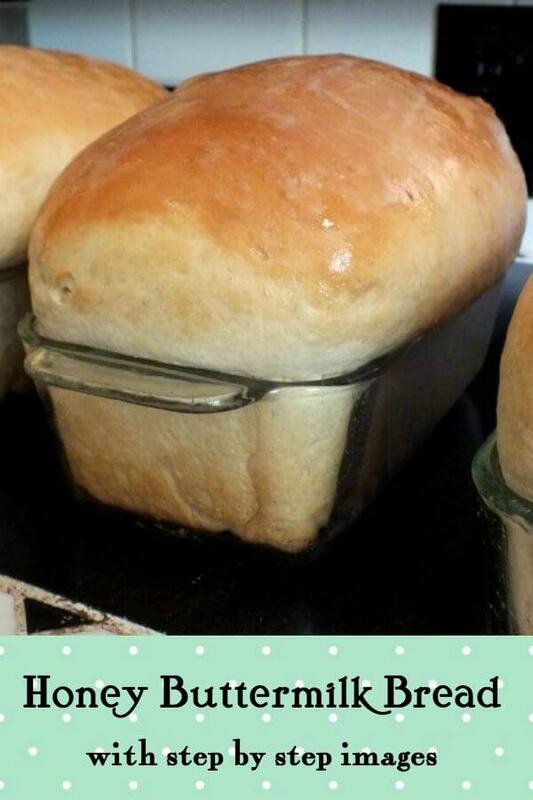 pinned this this morning, made by the afternoon winner, winner…bread with dinner! fantastic taste! i only had powdered butermilk (because, well, buttermilk is not one of those things we really keep or use around my house) but will definitely procure for the next go round of bread making. thanks so much for sharing your wonderfully, tasty recipe. Thanks for letting me know! So glad you liked it. I used sour milk and the bread had a weird flavor it also tasted like baking soda. 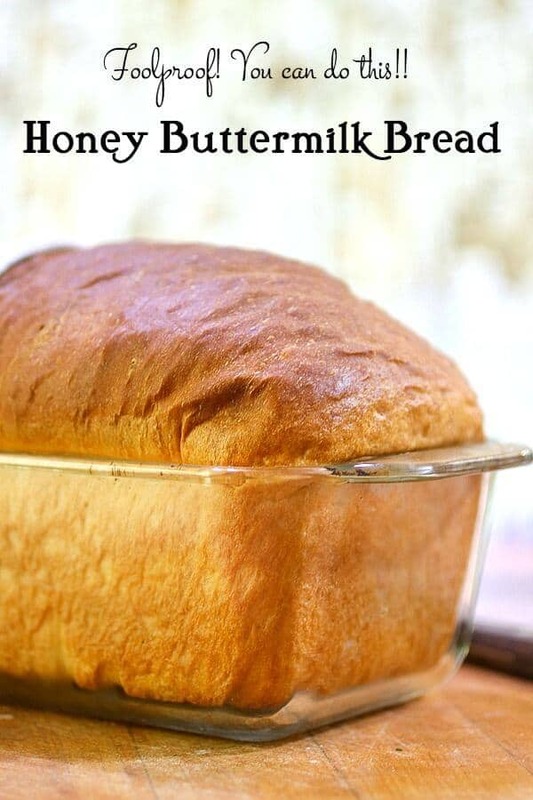 I am going to re-make it with actually buttermilk. i am guessing the sour milk was a bad idea? Yep. Buttermilk means buttermilk, not sour milk, not milk and lemon juice. 🙂 also double check your measurement on the baking soda… it should not taste of baking soda at all … it’s just 3/4 a TEASPOON for 6 cups of flour so the flavor is minimal. 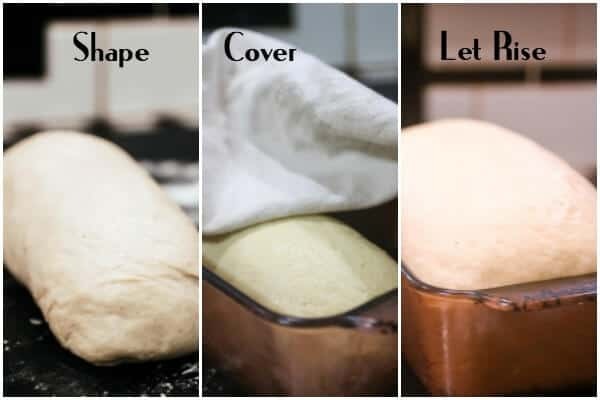 How do you measure your flour? Do you scoop it, spoon it into the cup? 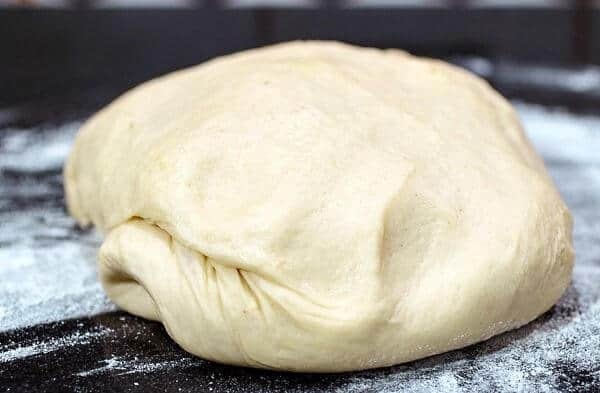 It is not a stiff dough compared to other bread doughs. I just made this bread and it did not turn out. I think I didn’t use the right yeast. 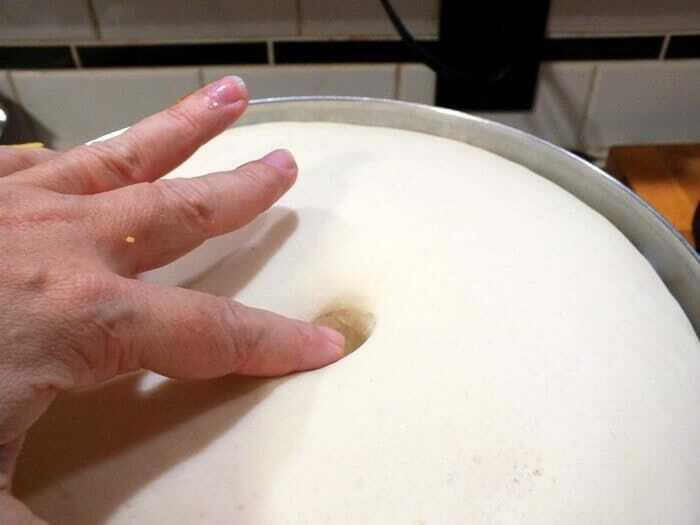 When I combined the yeast it didn’t foam or anything. I used all purpose flour. I’m surprised you have to use so much baking soda. My dough didn’t rise much. And once it was done baking it got darker than eapected and all i tasted was baking soda. Is there a specific baking soda to use? The dough wasn’t fluffy at all it didn’t rise much. Are you sure you used 3/4 TEASPOON baking soda? Because really that’s not very much. 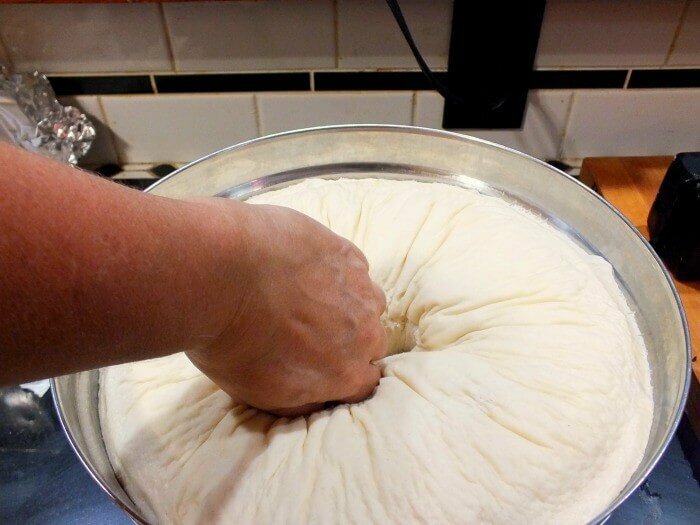 Use active dry yeast, make sure it foams up — if it doesn’t it’s too old. No I misread and used 3/4 cup of baking soda 😀 thats terrible haha. And I think the yeast was old anyways so I dont think it would have worked out. I will try again. I made it late at night. Oh no! Well that explains a lot! LOL! Wow this is a fantastic recipe. I was a little worried when my butermilk curddled but I just read your other viewers comments , and it’s okay !!! Thank you for your time to read and answer our questions. Hey everyone you must try this recipe you will not have any regrets . Bye for now !! Thank you! I am so glad you like it!! Can i just used buttermilk that you can buy in the grocery store?